Wearable art! 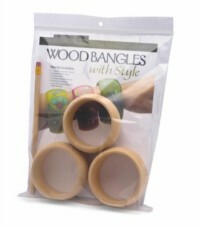 Show off your creativity and personal style with this do-it-yourself wood bangle kit. Inside each kit you will get three wooden bangle bracelets and an instructional booklet filled with great craft ideas and patterns. From decoupage to painting and even knitting-you'll find step-by-step directions for each crafting technique. Perfect for those looking to learn a new craft!